Welcome to Part 1 of our Spring CAL (crochet-a-long)! I'm so excited you're here and joining in to make these sweet Mini Berry Patch Bunnies! Today we will make the legs, body and head. The legs will be made separately and then joined together to make the body and head. By the time we're done it will all be one piece. No sewing required for Part 1, yes! If you are just learning about the CAL head over here to find out all the details, it's never too late to join in. 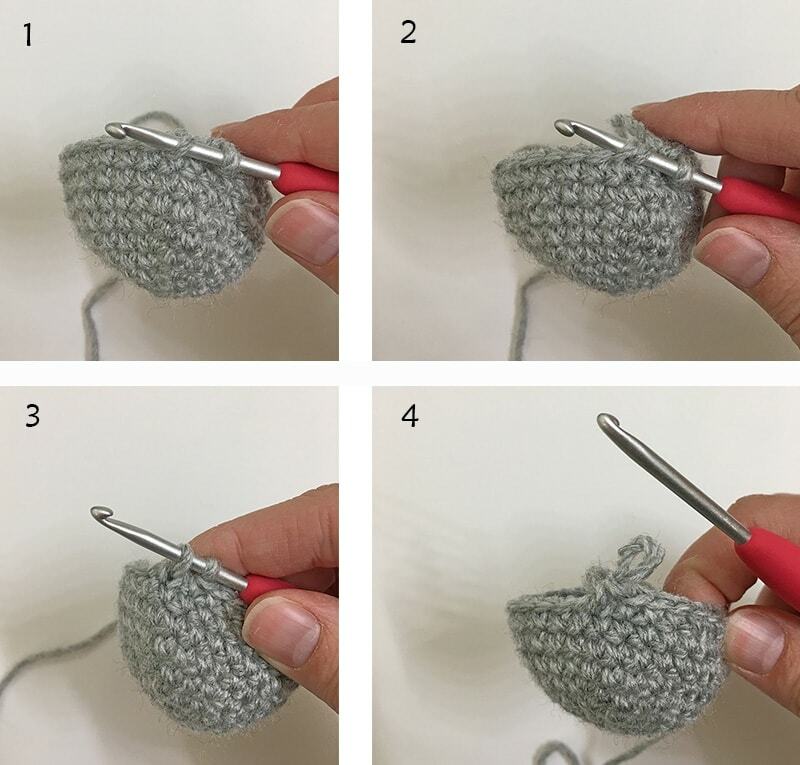 Each part will remain free here on the blog so you can crochet at any pace. 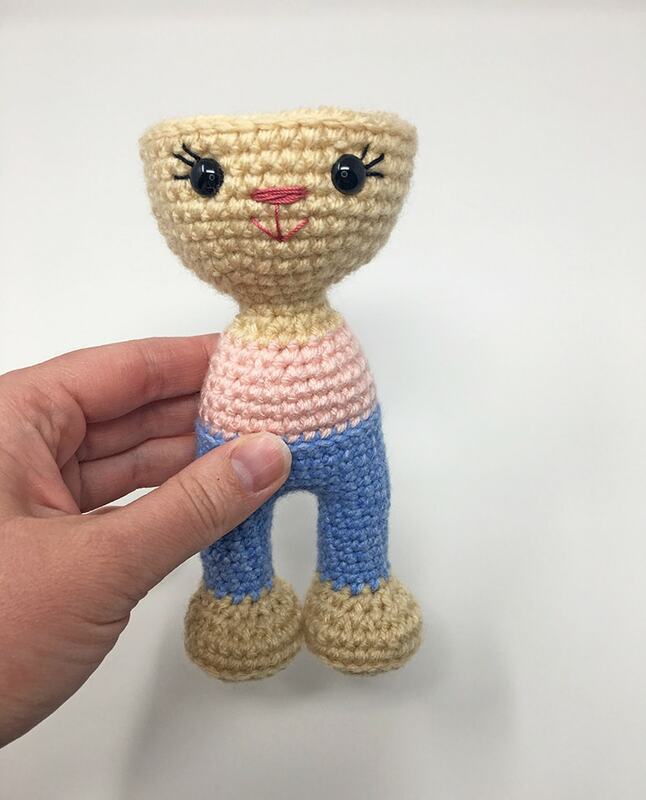 Be sure to share your photos in the Grace and Yarn Crochet Group on Facebook, we'd love to see your mini bunnies! This is also a great place to ask any questions you have along the way! PIN Part 1 to your crochet board here! Some of you have shared that this will be your first CAL, yay! If you have any questions feel free to share them in the group or send me a message. 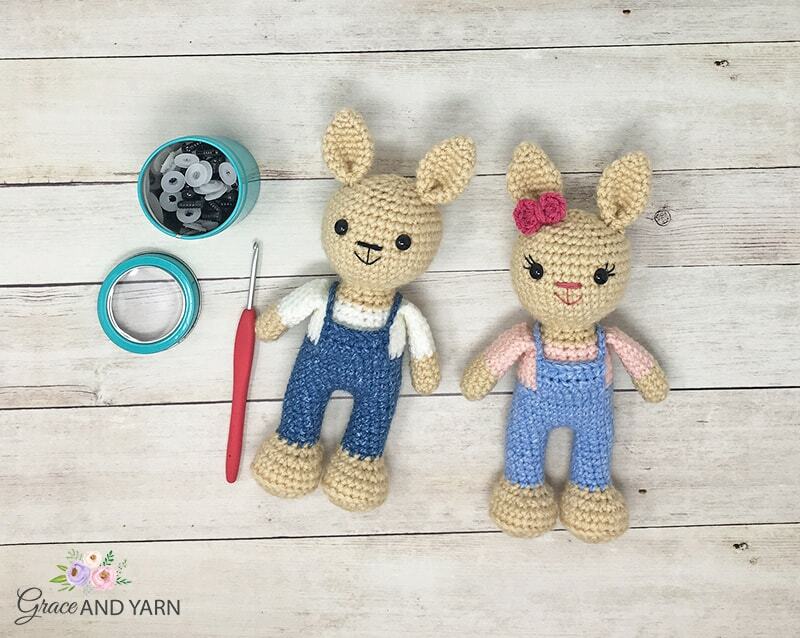 I hope you enjoy making your own mini bunny! Don't want to miss any new patterns? Sign-up for my newsletter and I will send an email for each part of the CAL plus keep you updated when new patterns are released! For extra tips I have a right and left handed video tutorial to walk you through joining the legs and adding your facial features! Fasten off on the first leg only. 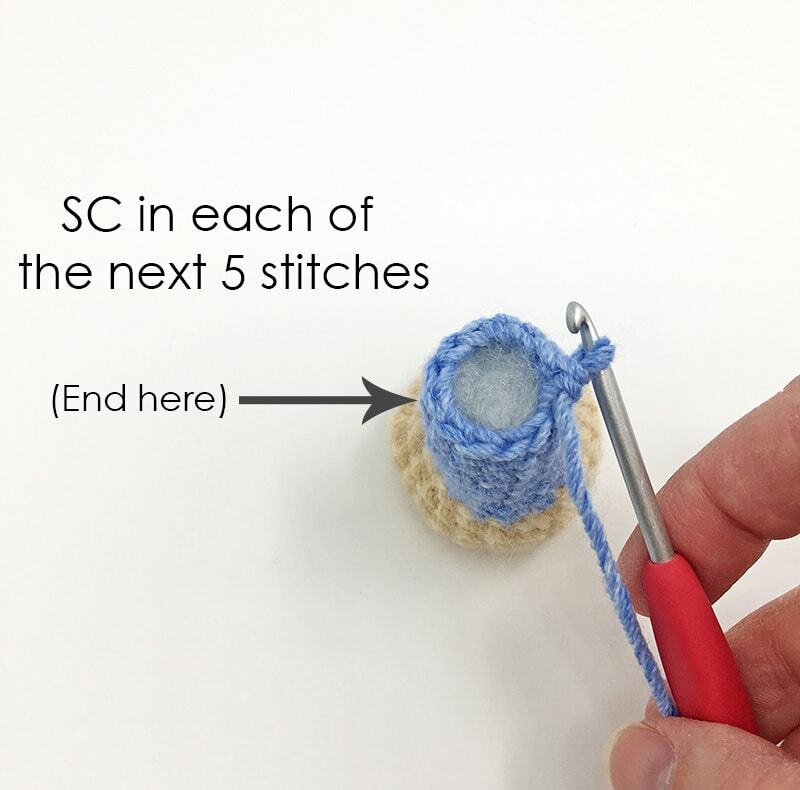 When you finish the 2nd leg, make a SC into each of the next 5 stitches (do not fasten off). This will line up your working yarn to be in the center of the leg for our join as well as ensuring both feet will be facing forward. Round 17: Chain 3 and attach to the first leg with a SC (make sure that both feet are facing forward). SC in the remaining sts around the leg. When you reach the chain make a SC across each of the 3 chains, SC in the remaining sts of the next leg and SC across each of the 3 chains again. You will have crocheted on each side of the chain. (30 SC) This completes your join and is where your next round will start. NOTE: Here is where we will attach the facial features. Place the safety eyes 5 stitches apart between rounds 40 and 41. (For the girl version, I recommend sewing on the eyelashes before securing your safety eyes). Nose/Mouth: Using embroidery thread place the nose centered towards the bottom row of your eyes, 1 stitch in on each side (this will leave 3 stitches in the middle and this is what you will pass your thread through to create the nose). 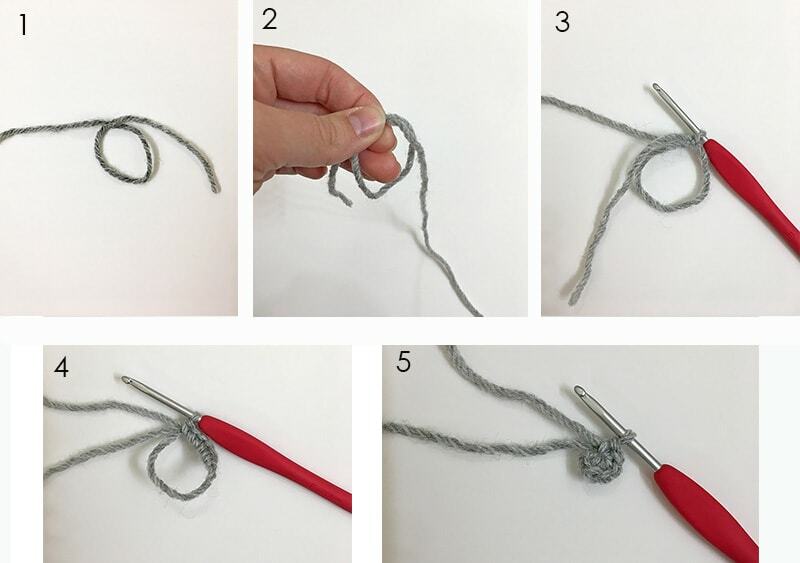 Pass your thread through 5-6 times (or as many as you would like for a thinner or wider nose). Use your thread to make a straight line down 2 rows and then a ‘V’ for the smile. Part 1 is complete, we're halfway done! I'll see you back on Monday for Part 2 where we'll make the ears, arms and straps! 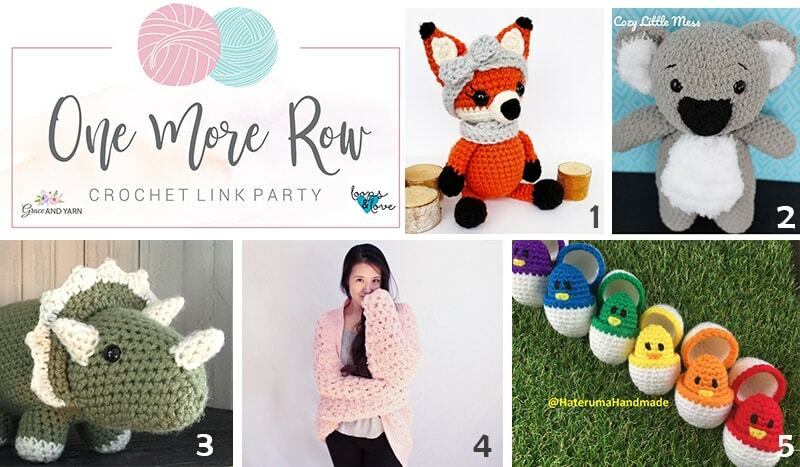 If you're on the search for a few more Spring projects check out our most recent crochet link party, One More Row! It's full of some fun and free patterns shared by various designers around the web!